Save a bit on organic, natural, green, gluten-free and other foods thanks to this handy round-up courtesy of Mashup Mom. $1.00/1 Schar gluten free product (Facebook). $3.00/2 Wild Harvest cereal. Sold at SuperValu-supplied stores. New $.75/1 Earthbound Farm product here. These have been printing as good on any EB Farm. $1.50/1 Kashi soft baked squares. $1.00 off fruit when you buy one Kashi. $.50/1 Kettle brand chips -- they have an organic variety. $2.00/2 Silk Almond half gallons. $.75/1 Silk almond half gallon. $.55/1 Hormel natural choice lunch meat. This is gluten free. $1.00/1 Rudi's gluten free product. New on Mambo Sprouts: $1.00/2 Horizon Organic Milk, $1.00/1 Arrowhead Mills baking, $1.00/1 Sunspire baking chocolate, and more. 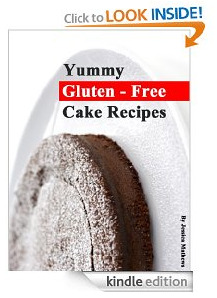 Currently free for Kindle: CELIAC : Gluten-Free Recipes. Kindle freebies usually only last a day or so before the price changes. Enjoy Life Semi-Sweet Chocolate Chips, Gluten, Dairy, nut & Soy Free, Mini Chips, 10-Ounce Bags (Pack of 6), $19.32 and eligible for free super saver shipping over $25.00 or Prime. That's $3.22 a bag. Annie's Homegrown Five-Grain Elbows & White Cheddar Macaroni & Cheese, Organic, 6-Ounce Boxes (Pack of 12), $23.48 shipped with subscribe & save. Today only! Receive an additional 10% discount off select Subscribe & Save items when you use your MasterCard card. Offer valid through November 30, 2012, or while promotional funds are available. The additional 10% discount you receive from using your MasterCard card is only applicable towards your first shipment of select Subscribe & Save items. Enter code MSTRCRD1 at checkout. Bob's Red Mill Gluten Free Pizza Crust Mix, 16-Ounce Bags (Pack of 4), $9.84 shipped with subscribe & save. Each of these makes 2 crusts. Ener-G Foods Wheat-Free Pretzels, 2.65 ounce bags (pack of 20), $18.44 and eligible for super saver shipping over $25.00. This is a warehouse deal, and $.92 a bag. Garden of Eatin' Tortilla Chips, Mini White Rounds, 7.5-Ounce Bags (Pack of 12), $23.74 shipped with subscribe & save. Bob's Red Mill Rice Flour Brown, 24-Ounce (Pack of 4), $9.84 shipped with subscribe & save. Get half off Home Free gluten free allergy friendly cookies! Also check over on the right for a gluten free oatmeal deal from Bakery On Main.